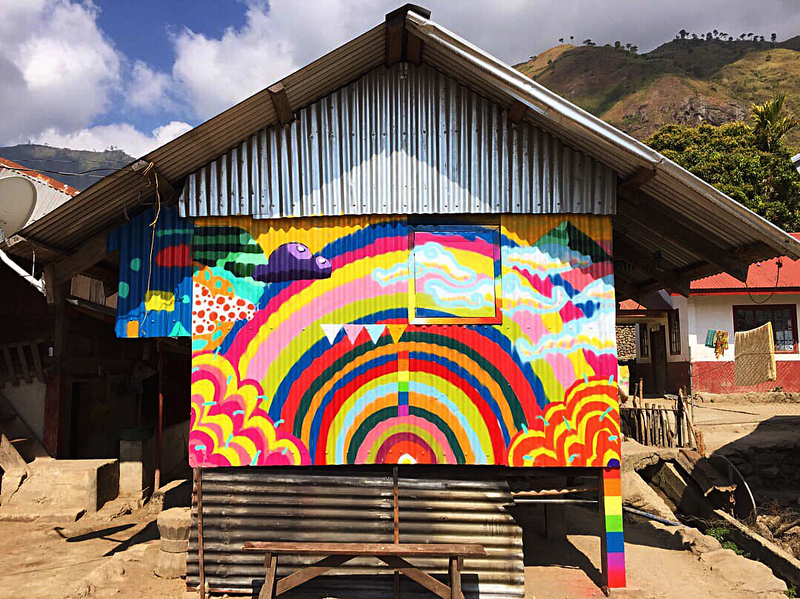 March 14, 2019, a few days after the culmination of the artist-led and community-based art activity, the Buscalan Village on top of the Tinglayan Municipality in the Mountain Province was transformed into a visual feast of cultural stories and identity. Initiated by artist Archie Oclos, together with street artists, cultural workers, and art practitioners, Kris Abrigo, Bvdot, Jenn Ban, Doktor Karayom, Ralph Eya, Ilona Fiddy, Dee Jae Paeste, Kookoo Ramos, and Sim Tolentino, the collective action is an effort to create and expand spaces of artistic expression that facilitates communal experience and interaction for the Filipino people. Oclos explained that this event is about sharing different art forms, media, and culture with different communities in the Philippines, as well as, instigating an inquiry on how artists can respond to a community and to today’s challenges in the country. 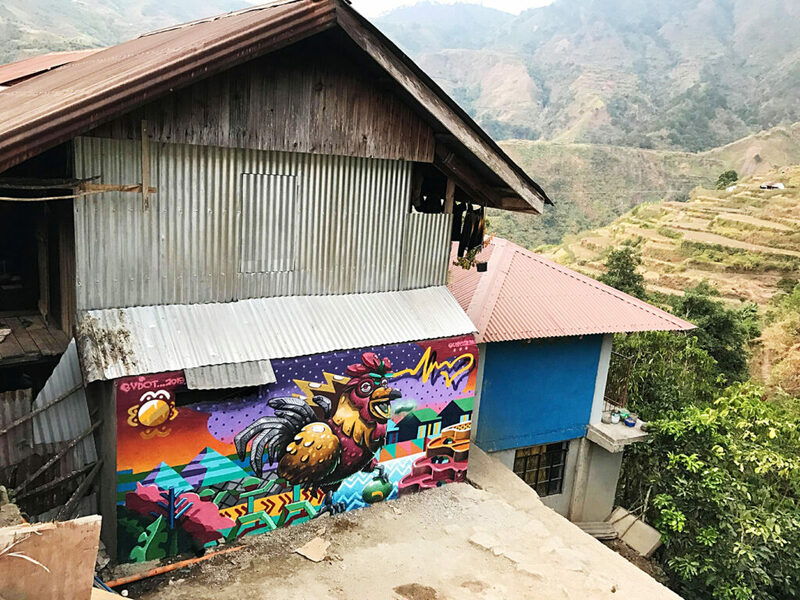 Armed with a vision and an entire vehicle of art paraphernalia, the team went on a 4-day mission to immerse, connect, and collaborate to create community murals on various sites of Buscalan Village. 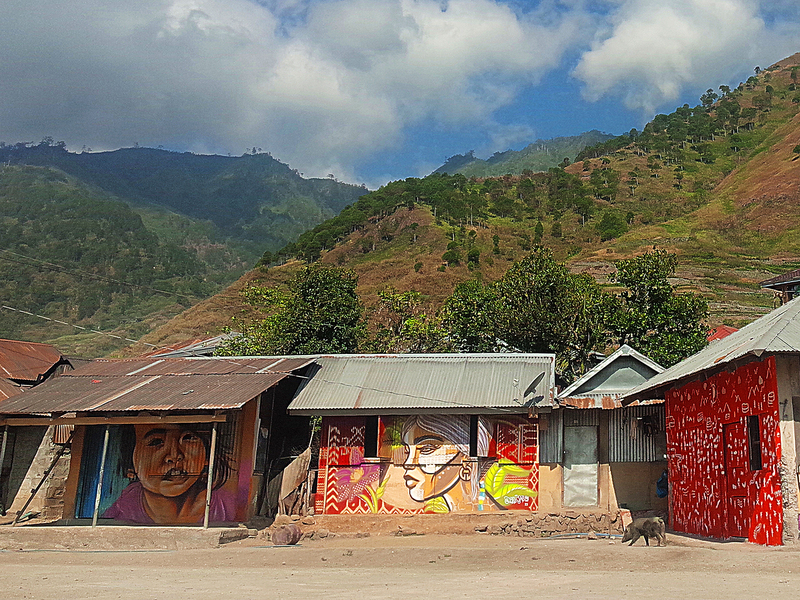 “The locals practice communal living in Buscalan. Their ways of living are rooted in their own beliefs and traditions. It is an ideal condition where people are in charge of cultivating their own culture. 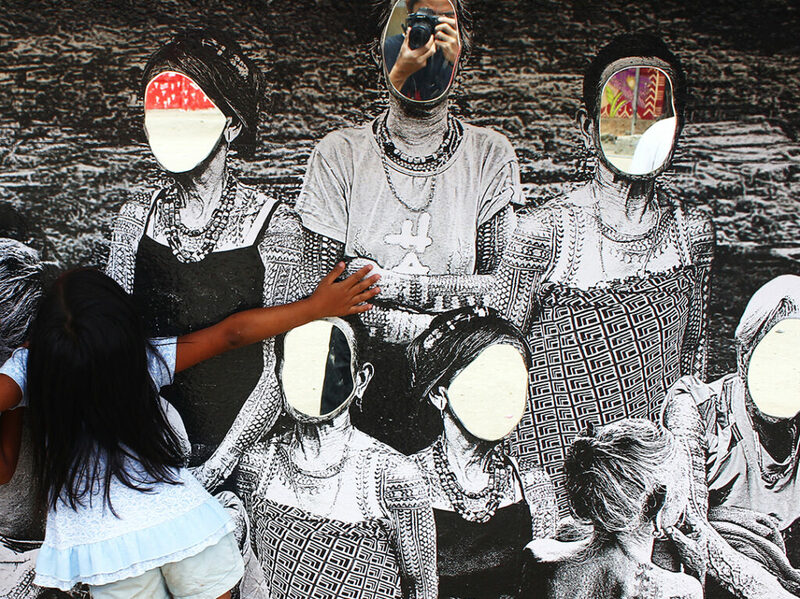 As artists, our work here is about bridging the gap of the traditional and the contemporary. 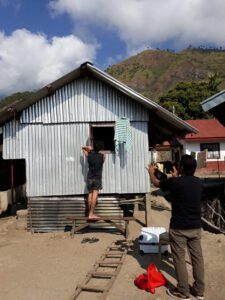 For example, I based my piece on the stories of the indigenous group and the local homeowners, about how they bring in commercial products up there in the mountains. The people know that they need those products to sustain their living, but in the process, they also recognize that they too, become dependent of the existing system of commerce. They also need to somehow go with the flow of modern times. So, what can we do? I think what we need to acknowledge here is their right to decide for their own community. It’s actually their community, not ours. They have the right to self-determination. We are just messengers of their causes” Oclos said. 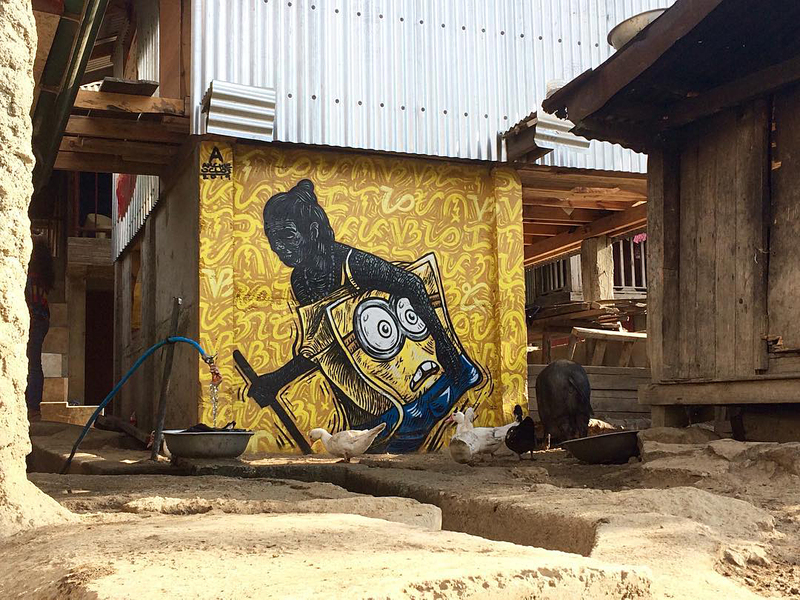 Street artists Bvdot and Doktor Karayom’s works are virtually representations of what Oclos is pertaining to. 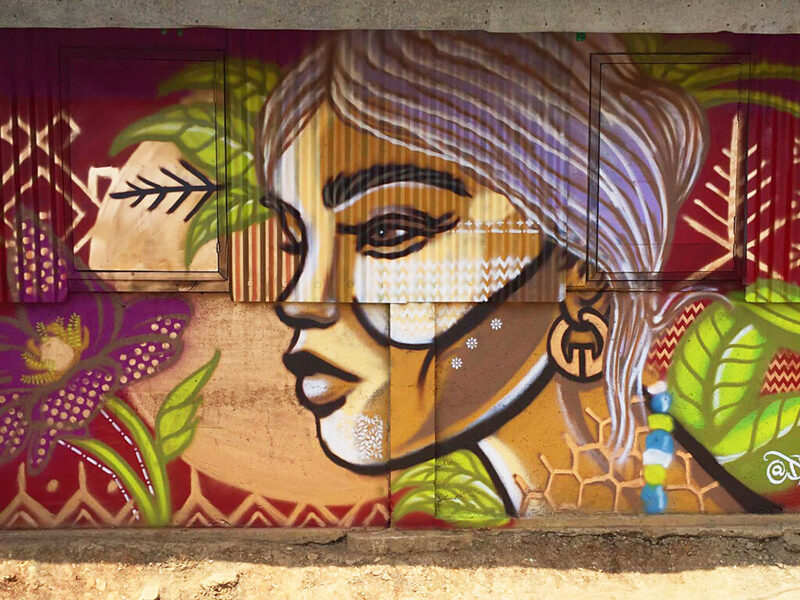 The murals of Bvdot and Karayom are likewise anchored in a community-driven narrative. Both artworks mindfully connected elements of the Buscalan culture, work, and environment to our daily lives while respecting the uniqueness and treasures of the village. 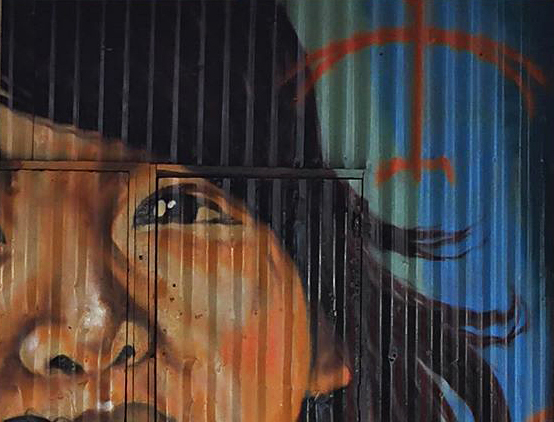 Bvdot’s “Tagpuan” or “Meeting Place” was thoughtfully based on his immersive experience and the story of Nanay Ampit (Mother Ampit) and the Butbut tribe of Kalinga. “Working and immersing with communities made me realize that wherever we go, we must respect each other’s traditions and ways of life. We should always remember to live and let live” Bvdot said. “It is important for us to know our place in a ‘foreign’ place. Not just because people live up here in the mountains, doesn’t mean they know less. And we, the city dwellers, know better than them. I feel that the people here actually know what living means more than us” Karayom added. 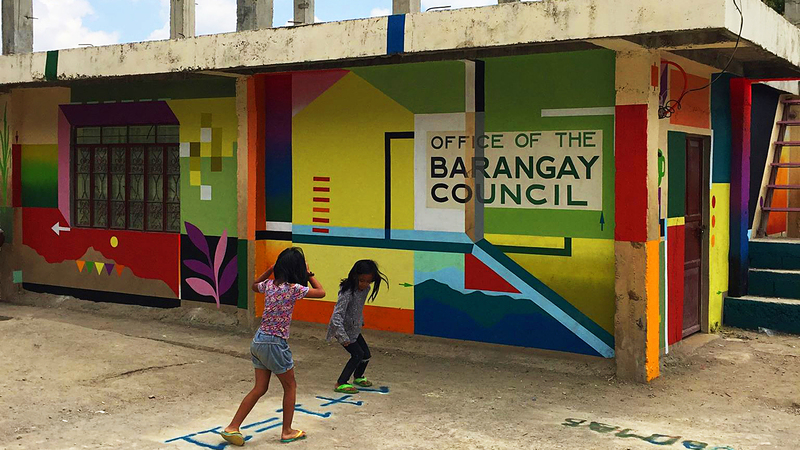 While valuing the same principles, urban artist Kris Abrigo further explored creating a fusion of the old and the new for his work with the community, he defined his involvement in the activity as a way of contributing to community design and highlighting the relationship of its structures to the people. 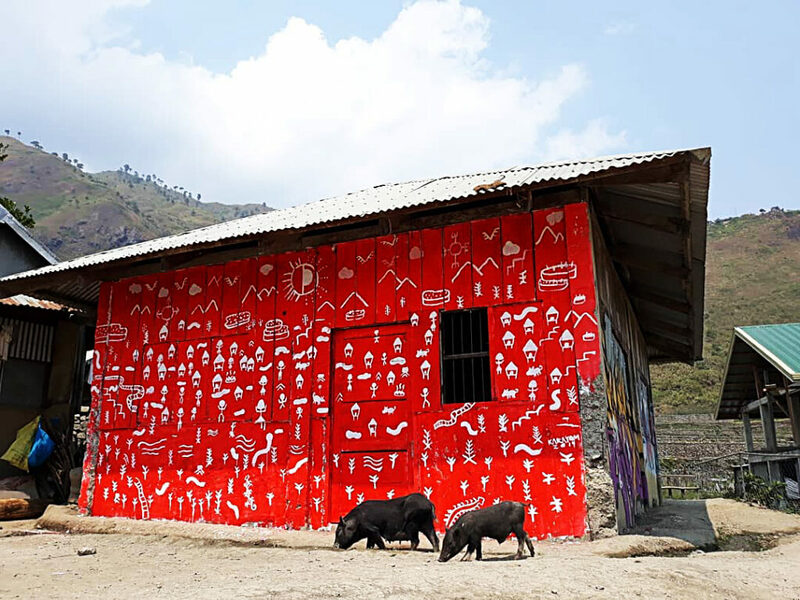 “It’s about transforming basic local concrete architecture (barangay hall) into something that represents the people and reflects the place around it while focusing only on the essential, recognizable, and significant objects that the viewers can relate to” he said. As for muralist Kookoo Ramos, the entire event was about relational processes. Being able to meet genuine individuals and developing a similar level of consciousness about cultural identity among them was considered a game changer for her. Aside from raised questions about living conditions, the exposure to community work incited criticality in her art process. 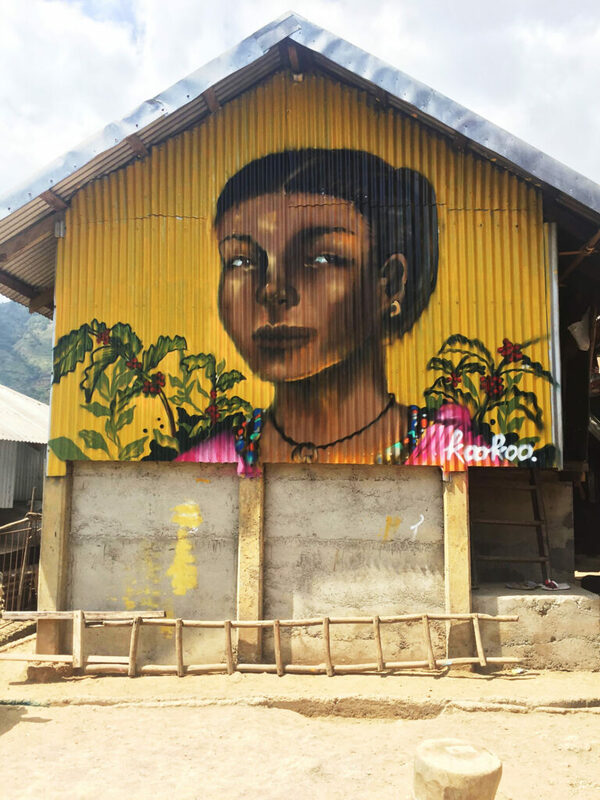 “There were a lot of visual inspirations in the area, mostly symbols of livelihood which resonates a lot with hunting and farming; animal bones, dried plants, wooden items, and other articles of nature hanging outside their household. Seeing all those materials, I initially wanted to incorporate a carabao skull for my female portrait piece. As a woman, it felt right to illustrate a female portrait wearing a skull headpiece that would symbolize men’s work which can also be done by any woman. But from what I saw in Buscalan village, the role of women seemed simple, but it is definitely relevant for them. ‘Tunay silang Ilaw ng Tahanan’, and there was no need for me to exaggerate, twist, or create a more ‘aesthetically appealing’ statement piece. Because I found value in that simplicity. The fundamental value of taking care of the people, the community, and the next generations to come. If this experience changed me, I am hoping that artist initiatives like this will trigger and ripple more change with and to others as well” she concluded. 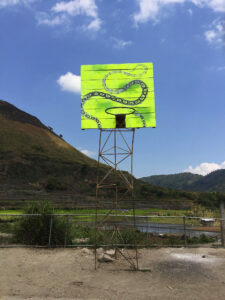 Community-based art practitioner and advocate Ralph Eya ultimately described the project as a living testament of what the merging of artistic production, collective action, and active social participation is capable of doing. 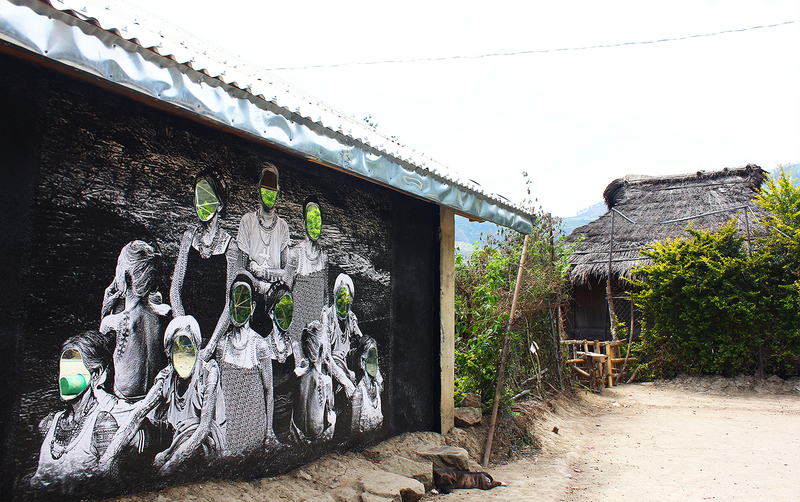 According to artist Jenn Ban, the socially-engaged art project will be a continuing effort of the team. The initiative aims to sustain a conscious effort and reach different communities in various parts of the Philippines in the following years. Thus, looking forward to create a ripple effect among like-minded individuals, artists, community leaders, cultural workers, stakeholders, and the youth. The team believes that when artists and communities rise up and unite, it can do so much and art might just be powerful enough. That social transformation is about treating every action as a contribution. That every community is part of humanity. And people will rise when art continuously strikes. Community art is rising.